Discover health benefits of lemon juice! 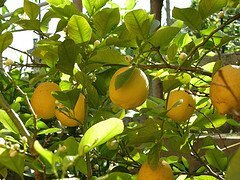 Lemons are small, oval-shaped, yellow fruit grown on the Citrus limonium tree. Lemon juice has a very sour, tart, taste due to its citric acid. Most people do not drink it by itself. It can cause damage to tooth enamel when used at full strength. Instead, dilute it or sprinkle it on as an added flavoring to foods or drinks. It's delicious over salmon or salads. Use it in water or tea. Use only a small amount. Lemon juice contains vitamins A, B1, B2, B6, C and E! The vitamin C content is very high! One quarter cup of lemon juice supplies over 33% of the recommended daily value of vitamin C. One cup of raw lemon juice has approx. 60 calories, 2 mg of sodium, 6 g of sugar, 1 g protein and 1 dietary fiber. The sugars in lemon are unrefined, natural and easily absorbed into the body. The minerals in lemon include: calcium, copper, magnesium, potassium and zinc. Lemon juice has benefits of antioxidants! Antioxidants fight free radicals that cause damage to skin. Free radicals attack our bodies through industrial fumes, exhaust fumes, pollutants, UV rays and other ways. Skin may show dark spots, discolorations, fine lines or wrinkles. With benefits of vitamin C, lemon juice provides an overall better appearance, with a natural radiant glow. It tightens and lightens skin. Lemon juice has antiseptic, antibacterial & astringent properties. It exfoliates dead skin cells & reduces oily build-up. It fights acne preventing re-occurrence. -- Use lemon juice sparingly. It is mildly acidic. It can sting when applied to skin. Dilute juice with water then apply with a cotton ball. -- Can cause photosensitivity, allowing skin to burn easier. Apply diluted juice at night to avoid UV daylight rays. -- Can cause dryness. After use, add a gentle moisturizer. -- Those with citrus allergies or sensitive skin should avoid using lemon juice. ACNE: Rub diluted lemon juice over blackheads at night then fine with cool water in the morning. Add a gentle moisturizer after rinse. Follow this regiment, daily, to eliminate blackheads and prevent future break-outs. ACNE & SCARS: Touch-up with diluted lemon juice, periodically. Rinse with cool water. Gently pat dry. Discover acne relief! EXFOLIATE, FADE DARK SPOTS, DISCOLORATIONS…. : Mix 1 tsp. of honey, 1 drop sweet almond oil, and 3 drops of diluted lemon juice for a homemade facial mask. Apply mixture to face for approx. 15 - 20 minutes, let stand, then rinse with cool water. Gently pat dry. FOR NATURAL GLOW: (* Dr. Oz recommended *) Mash 6 to 12 "non-coated" aspirin. Combine with freshly, squeezed, lemon juice. Allow aspirin to dissolve until a pastey texture appears. Apply paste mixture as a homemade face mask. Leave on 10 minutes. To remove mask, mix together baking soda and water. Dip cotton balls in baking soda mixture then gently apply to skin. Rinse with cool water. Gently pat dry. Repeat once or twice per week. (Not recommended for sensitive skin, since it may be too drying). EXTRA TIP for Dr. Oz Recipe: ( If paste mixture becomes too flaky, add 1 tsp. honey, olive oil or aloe vera to help bond mixture a little better ).